For years we have bought bulbs based on the wattage, thinking that the higher the wattage the brighter the bulb. But what we need to learn to look at is the lumens, which is the amount of light produced, and not wattage, which is the amount of energy being used to produce that light. 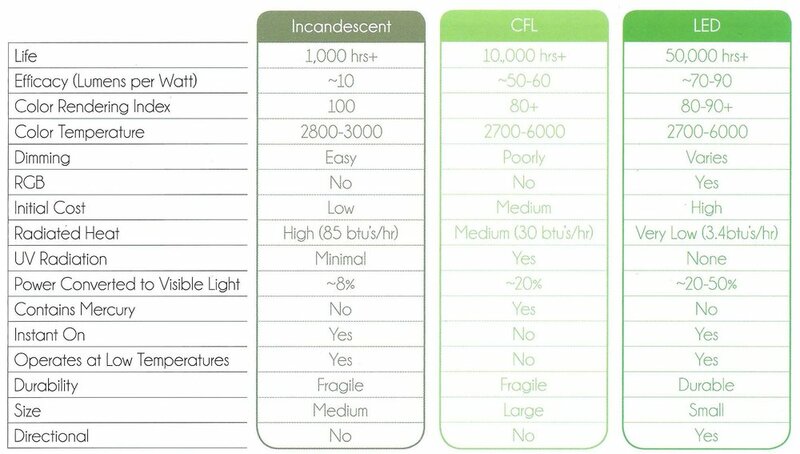 The chart below compares three light sources and the wattage used to achieve the same lumen output. You'll see that LEDs require a lot less wattage (energy) than incandescent or CFL to produce the same amount of light and therefore results in a lower energy bill for the same amount of light. A good rule of thumb is that 1600 lumens is equivalent to about a 100 watt incandescent bulb. Larry's Insight is a collection of thoughts and installs from his long career in architectural and interior design.